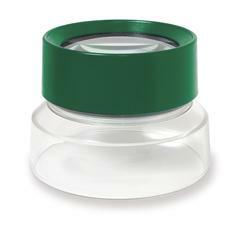 Professional grade acrylic optics allow you to see the finest details. Pre-focused for quick, easy viewing. Magnification is a fixed 5x power. Dimensions: 4.1875" x 4.1875" x 3"